This tiny clownfish is the star of the show in the hit movie "Finding Nemo"
Bound to be a star amongst your collection “Nemo” is an adorable clownfish who goes on a big adventure! From the hit movie, “Finding Nemo” this sweet little guy is 8 inches long and is sewn from orange and white mohair. He is detailed with embroidered eyes that are lined with orange around the black pupils and has airbrushed accents throughout his body. One of his fins is slightly smaller than the otherdue to a barracuda attack when he was an unhatched egg. 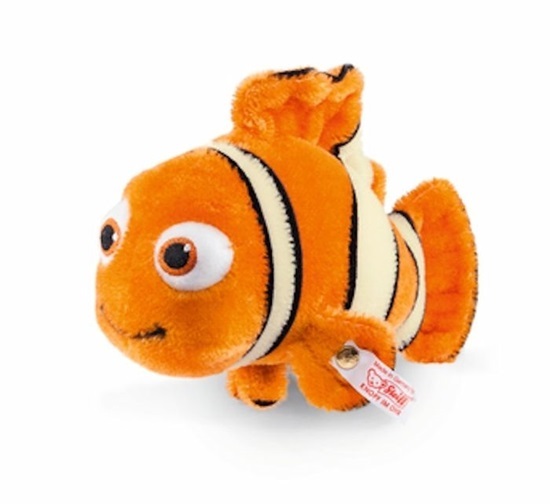 “Nemo” is limited to 2000 pieces and is part of Steiff’s Worldwide Limited Edition. He is surface washable and intended for adult collectors. He is a true gem just waiting to be added to your collection!